I read this article and found it very interesting, thought it might be something for you. 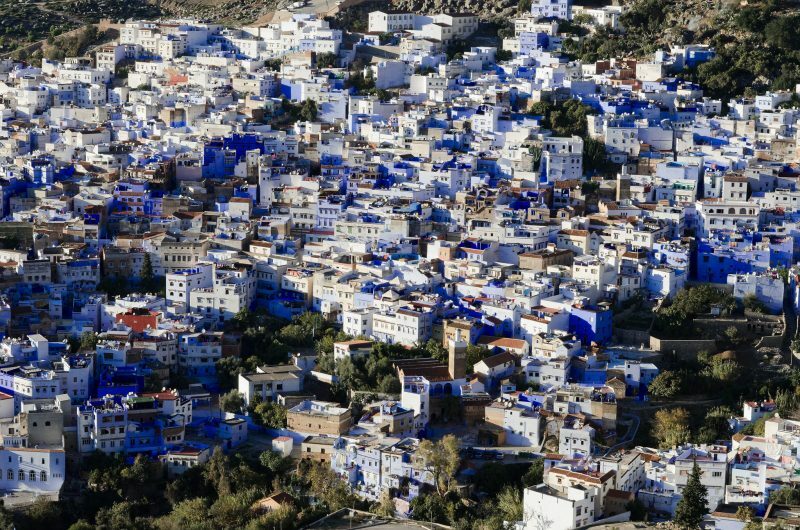 The article is called 7 Things about Blue City Chefchaouen and is located at http://trip-n-travel.com/listicle/21913/. 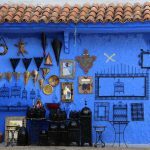 There are many interesting places in Chefchaouen and the blue walls make them even more attractive. This town is not so big; however, you can spend a lot of time here visiting all its shops and looking for souvenirs to your friends. Mountains and hills create great views, while friendly people make many tourists love the city. Chefchaouen is a unique city. This city defiantly has its own color, and this color is blue. You will recognize it even with a bird’s-eye view – many blue walls and buildings paint the whole city in blue. The city always seems fresh, elegant, and clean – maybe it is waiting for you? It is so beautiful! Narrow streets are full of interesting things. For example, this side street is decorated with flowers in flower pots. The stone city needs greens and people try to give it in many different ways. In the end, this looks fantastic and attracts many tourists. The city is sheltered by mountains and hills. They give interesting views and protect the city from the sun; surely, you will fill it only during dusk and dawn. 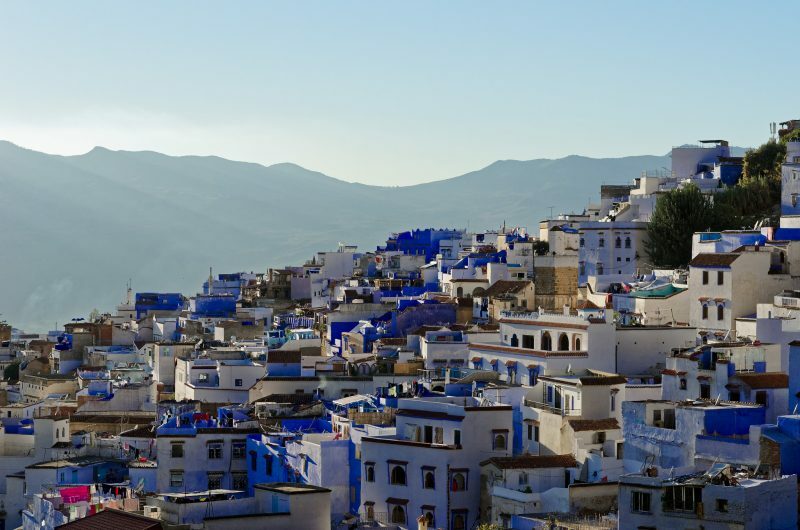 Chefchaouen is also located on a hillside, which makes its streets very picturesque. Most of the buildings look at mountains. You can buy many interesting things right on the streets of Chefchaouen. Street vendors sell all traditional handmade Moroccan souvenirs here: carpets, jellabas, lamps, caftans, Berber jewelry, and Moroccan wool hoodies. Don’t forget that you are in the East – it is absolutely normal and even necessary to bargain here. Alhambra Decree of 1492 pushed many Muslims and Jews to leave Spain. Spanish Muslims and Jews formed the appearance of the Moroccan city due to the traditions of their homeland, Andalusia. Look at these paintings on the walls – they are beautiful! Chefchaouen is located on a hillside that is why there are many stairs and stairways here. Despite the fact that the city is not so big, you can easily get tired of walking through its streets. So be prepared for a long walk and for many interesting views – Chefchaouen will surprise you. Chefchaouen is a unique city with its own inimitable atmosphere. All people feel it and try to follow the old-fashioned style when they build something new. Look at this city – it is the medieval bastion of architecture. Watch the video and go through the blue streets to feel the atmosphere. This city is a place with its own magic. 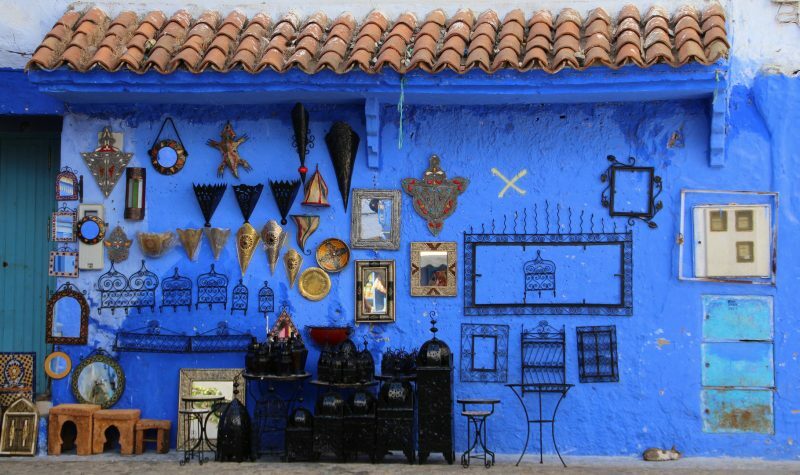 Many tourists visit it every year to see its blue walls, to feel the specific atmosphere of the medieval town, and, of course, to buy souvenirs. Many people love Chefchaouen from the first sight, and there is no doubt that you will like it too. Have a good trip and travel!